(AP) TOKYO - The Fukushima crisis is eroding years of Japanese efforts to reduce greenhouse gas emissions blamed for global warming, as power plants running on oil and natural gas fill the electricity gap left by now-shuttered nuclear reactors. Before last year's devastating tsunami triggered meltdowns at the Fukushima Dai-ichi plant, Japan had planned to meet its carbon emissions reduction targets on the assumption that it would rely on nuclear power, long considered a steady, low-emissions source of energy. But now it's unclear to what extent nuclear energy will even be part of the electricity mix. With the loss of nuclear energy, the Ministry of Environment projects that Japan will produce about 15 percent more greenhouse gas emissions this fiscal year than it did in 1990, the baseline year for measuring progress in reducing emissions. In fiscal 2010, Japan's actual emissions were close to 1990 levels. It also raises doubts about whether it will be able to meet a pledge made in Copenhagen in 2009 to slash emissions by 25 percent from 1990 levels by 2020. For years, nuclear power was a pillar in Japan's energy and climate policies. Until the Fukushima disaster last year, it accounted for about a third of Japan's power generation, and Tokyo had planned to expand that to half by 2030. 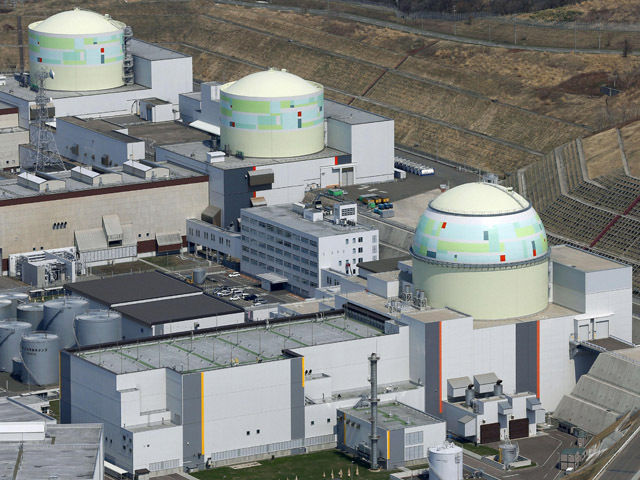 Now Prime Minister Yoshihiko Noda has pledged to reduce reliance on nuclear power, although his government is eager to restart some reactors to meet a looming power crunch during the hot summer months. "The big open question is whether and when the nuclear plants will come back on line, and what that implies for Japan's long-term emissions trajectory," said Elliot Diringer, executive vice president at the Center for Climate and Energy Solutions, formerly the Pew Center on Global Climate Change, in Arlington, Virginia. "If nuclear will no longer be a part of the energy mix, Japan is going to have a much tougher time reducing emissions," he said. Japan is a world leader improving energy efficiency, one important method of reining in emissions. But it has done less to expand renewable energy than several other nations, including Germany, which is phasing out nuclear power. Renewable energy accounts for about 9 percent of Japan's power generation -- similar to the U.S. Most of that energy is hydroelectric power from dams; and some experts say solar and wind power are too intermittent to be a reliable source of base-load energy. As an incentive, the government will require utilities to buy power from renewable energy producers for a fixed price called "feed-in tariffs" starting in July. But the higher cost to produce renewable energy will mean higher prices for consumers. The 28-nation International Energy Agency maintains that nuclear power remains an important tool to battle global warming. "If you want to have something at a reasonable cost in terms of low carbon-emissions, then nuclear has to play a role," said Ulrich Benterbusch, director of the Paris-based group's Directorate for Global Energy Dialogue. "If you have more renewables in the mix, it's going to be more expensive." The government plans to announce a new energy strategy this summer with targets for renewables, nuclear and conventional power generation. In the meantime, Japan is spending billions importing extra oil and gas to meet demand -- which is spewing more greenhouse gases into the atmosphere. Without nuclear power, Japan is projected to produce an additional 180 million-210 million tons of emissions this fiscal year compared to the base year of 1990, when emissions totaled 1.261 billion tons. That wipes out a significant chunk of reductions Japan achieved during 2008-2010 through energy efficiency, credits for helping developing countries devise cleaner technologies and planting trees to absorb carbon dioxide. Officials believe Japan can still barely meet its commitment under the Kyoto Protocol to reduce emissions during the five-year period through 2012 by an average of 6 percent from 1990 levels. Some experts see a model in Germany, which turned decisively against nuclear power after the Fukushima crisis, shutting down eight reactors and planning to close the remaining nine nuclear power plants by 2022. Yet its greenhouse gas emissions decreased 2 percent last year from 2010, and by 26.5 percent compared to 1990. While a mild winter seems to have helped, Germany's growing renewable energy sector, which now accounts for over 20 percent of power generation, played a key role in that emissions decline, experts say. The German government has been actively promoting green energy for more than a decade, and aims to boost the share of renewables to 35 percent by 2020 -- and 80 percent by 2050. "If the government puts in place the right set of policies and incentives, then Germany is an example that you can reduce nuclear and greenhouse gases at the same time," said Jennifer Morgan, director of climate and energy program at the World Resources Institute in Washington. Germany, however, has a safety net that Japan lacks. If it has shortfalls or blackouts, Germany can buy electricity from neighboring countries through the European power grid. The island nation of Japan has no such fallback. Japanese politics, with its high leadership turnover, internal power battles and gridlock, is another obstacle. Its track record in recent years has been marked with indecision. If Japan can put its collective mind to expand renewable energy, it too can achieve similar levels as Germany, said Sei Kato, deputy director at Environment Ministry's Low Carbon Society Promotion Office. "We have the technological know-how. Japan can do anything Germany can," Kato said.